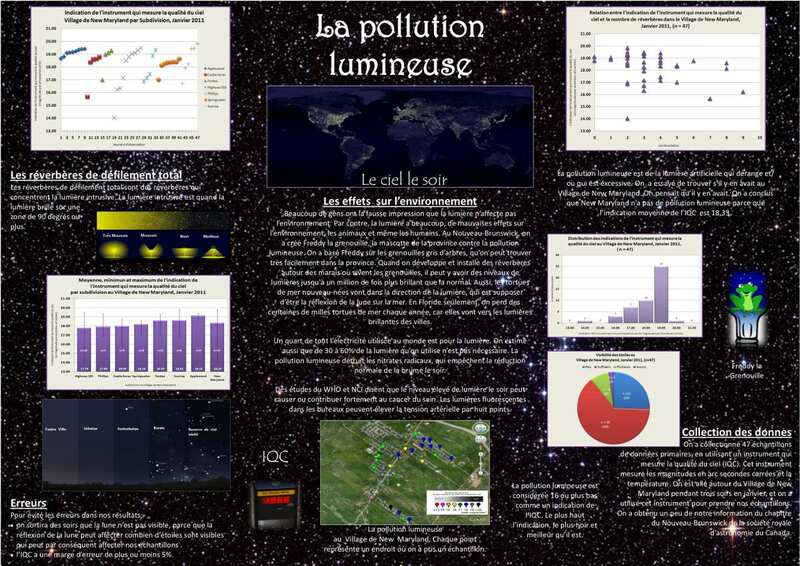 New Brunswick, Canada: Grade 8 students Holly Ayles and Emily Baxter are national winners in the recent International Statistical Literacy Poster Competition. Their poster will go to international level in Dublin Ireland later in August. SQM user Henk Spoelstra of Lumineux Consult has set up a network of SQM-LE units to monitor sky brightness in the Netherlands. 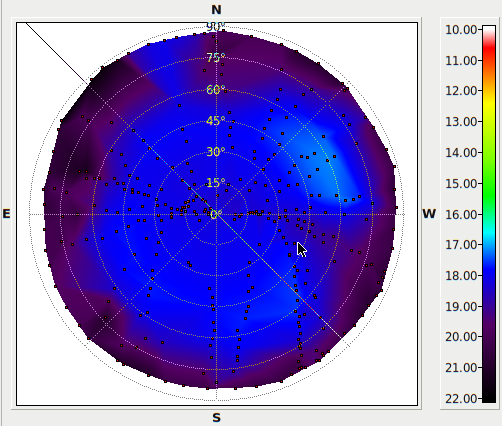 You can view his nomograph of light pollution factor and readings plot here. Here is an experiment to try to identify a clear sky using the SQM-LE/LU by observing the fluctuations in light level caused by clouds. A Survey of Light Pollution in Hong Kong. Researchers at the Department of Physics of The University of Hong Kong completed their light pollution survey and collected near 2,000 night sky brightness data sets from SQMs at more than 220 observation sites around Hong Kong during the past 15 months. GLOBE at Night: Shed Light on Light Pollution! Podcast. Connie Walker of the NOAO discusses the Globe at Night project as part of the 365 days of astronomy during the Year of Astronomy. Knightware, makers of "Deep-Sky Planner", have released SQM Reader Pro for Windows and the SQM-LE. This low-cost package adds graphing, statistical calculations, extended data storage and transmission capabilities to the basic feature set of existing "SQM Reader" software. Dark Skies Awareness, an IYA2009 cornerstone project helps people appreciate the dark sky with 11 projects including the GLOBE at Night campaign using both visual and SQM readings. Unihedron receives the Executive Director Special Award and the Certificate of Appreciation for its exhibit at "The Night: Why Dark Hours Are So Important" symposium in Washington DC. Sky Quality Meter - LU-DL-V "You've got to kick at the brightness 'til it bleeds starlight." A USB enabled vector data-logging light meter for night-time sky brightness monitoring! An affordable meter for continual, connected or autonomous data-logging to measure sky brightness for astronomers and light pollution investigators. The "Sky Quality Meter - LU-DL-V" (SQM-LU-DL-V) measures the brightness of the night sky in magnitudes per square arcsecond. Measuring the night sky brightness during remote biological field experiments. Find out how good the night or site REALLY is. Compare the sky brightness at different sites quantitatively. Document the evolution of light pollution in your area. Set planetarium dome illumination to mimic the skies people are likely to experience elsewhere in the city. Monitor sky brightness through the night, night-to-night, and year-to-year. Determine which nights show the greatest promise for finding the 'faintest fuzzies'! Calibrate the effect of sky brightness on qualitative measures such as the Bortle Scale. Investigate how sky brightness correlates with the solar cycle and month-to-month sunspot activity. Help provide local ground truth for future sky brightness prediction with the Clear Sky Clock. CCD users can make a correlation between the SQM reading and when the background reaches some ADC level. Sky brightness reported in visual magnitudes per square arcsecond. Infrared blocking filter restricts measurement to visual bandpass. Sensor temperature, model number, and serial number are provided. Precision readings at even the darkest sites. All the features of our SQM-LU (USB model) plus Data logging capabilities and vector measurements. 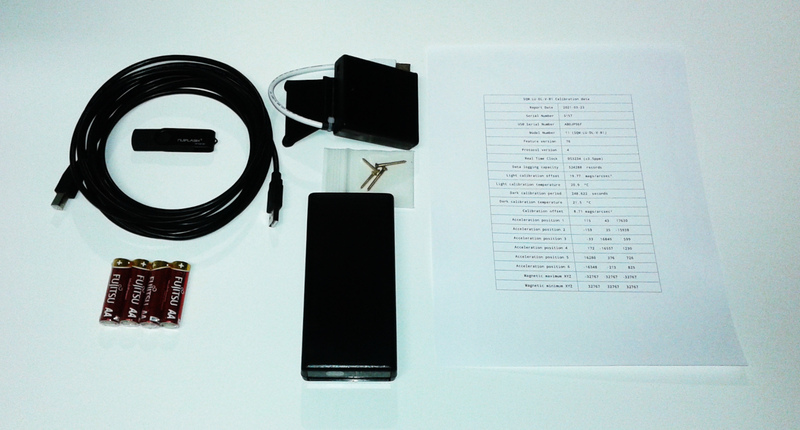 Data-logging capabilities while operated from external battery. Vector measurements of Altitude and Azimuth (built-in accelerometer/compass module). Included applications for reading data in Perl. The Half Width Half Maximum (HWHM) of the angular sensitivity is ~10°. The Full Width Half Maximum (FWHM) is then ~20°. The sensitivity to a point source ~19° off-axis is a factor of 10 lower than on-axis. A point source ~20° and ~40° off-axis would register 3.0 and 5.0 magnitudes fainter, respectively. The "V" model comes with an improved lens/filter arrangement, see the comparison to the standard "L" model here. Size 5.5 x 2.6 x 1.1 in. Maximum light sampling time: 80 seconds. Minimum light sampling time: 1 seconds. Battery adaptor fashioned like a handle for easy use in field during all sky surveys. 3D part view. The compass readings are very sensitive to any nearby hard and soft iron. The unit works well by hand operation as shown above. There is a slight magnetic offset (pinched and stretched at ≈±5° in some directions) due to internal components which have yet to be compensated for in the UDM software, but the compensation is planned for a future release of UDM. The lens/filter arrangement has been improved over our standard "L" models. 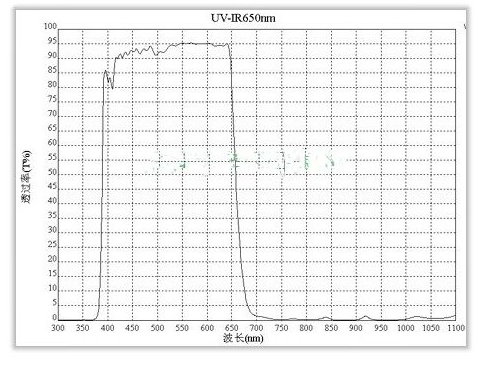 A comparison with the new UVIR650 IR Filter and half-ball lens can be found here. spectral response. 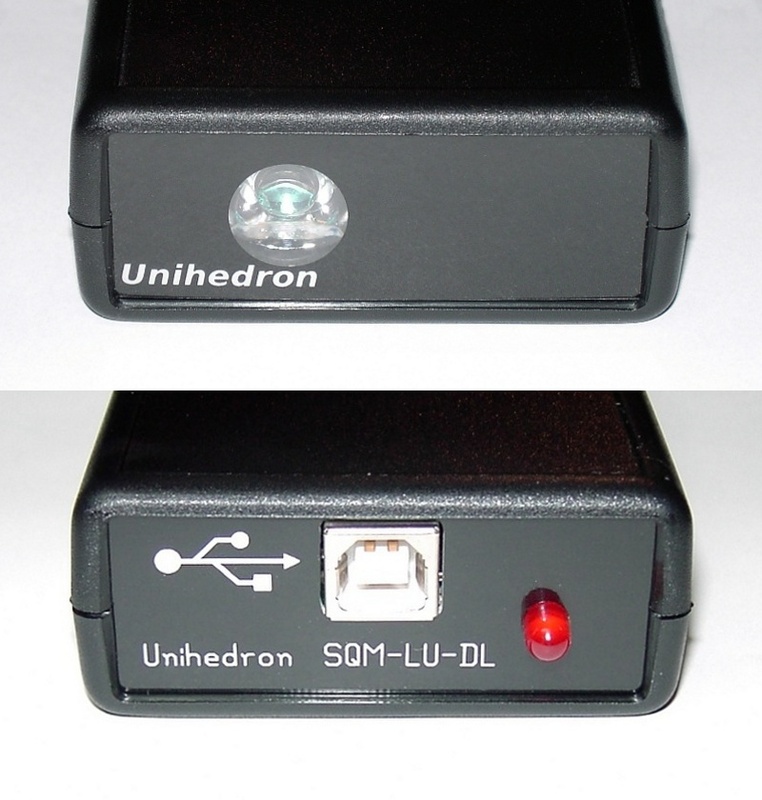 USB flash drive containing the users manual, operation software (UDM), and example software. The can also be found online. Price $339.99US plus Shipping & Handling. Night Sky Photometry with Sky Quality Meter by Pierantonio Cinzano. "Contributions of artificial lighting sources on light pollution in Hong Kong measured through a night sky brightness monitoring" article by Chun Shing Jason Pun, Chu Wing So, Wai Yan Leung, Chung Fai Wong. Science direct arxiv. Human Contrast Threshold and Astronomical Visibility paper by Andrew Crumey. Report on sky colour: Red is the new black; Chris Kyba and colleagues PDF. Documenting Local Night Sky Brightness report, Jennifer Birriel of MSU. Measure Night Sky Brightness at Various Zenith Angles report, Jennifer Birriel of MSU. "Night sky photometry and spectroscopy performed at the Vienna University Observatory" published in the "Journal of Quantitative Spectroscopy and Radiative Transfer" Science Direct arXiv. "The night sky brightness at Potsdam-Babelsberg including overcast and moonlit conditions" published in the "Journal of Quantitative Spectroscopy and Radiative Transfer" Science Direct arXiv. "Worldwide variations in artificial skyglow" by Christopher C. M. Kyba,	Kai Pong Tong,	and more. Published in Nature.com : Scientific Reports. "Intercomparisons of Nine Sky Brightness Detector" by Peter den Outer, Dorien Lolkema, Marty Haaima, Rene van der Hoff, Henk Spoelstra, and Wim Schmidt. Published in 2014 The National Center for Biotechnology Information. "Initial Irish light pollution measurements and a new Sky Quality Meter-based data logger" by B Espey, PhDa,b, and J McCauley, MSca. Published on February 2014 vol. 46 no. 1 67-77. Lighting Research and Technology. Excursion to Dark Sky Preserves in Canada 2015 by Andreas Hänel. SQM cross-calibration procedure by the BuioMetria Partecipativa team, 2011 PDF. Poster on the BuioMetria Partecipativa project presented at the IAU 2012 General Assembly in Beijing. Dark box for low-light-level measurements of a camera using an SQM-LU PDF by Peter Hiscocks. Integrating Sphere for Luminance Calibration PDF by Peter Hiscocks. Birds advance their dawn chorus near airports Report uses SQM to assist in determining bird chorus timing due to other effects. By Diego Gil et al. Comprehensive list of SQM related reports found on 2017-02-17. Quantifying and Monitoring Darkness over the RAO (Rothney Astrophysical Observatory) By Phil Langill and Benjamin George. Temperature Stability of the Sky Quality Meter By by Sabrina Schnitt, Thomas Ruhtz, Jürgen Fischer, Franz Hölker, Christopher Kyba. Unihedron Database of Sky Quality Meter readings from around the world. Globe at Night : Maps and Data. Database of readings from Turkey with map. SQM-Network is a free network of connected SQM meters from around the world. BuioMetria Partecipativa - Participatory Night Sky Quality Monitoring project base in Italy. Active since 2008. CORDILIT - Network of light pollution sensors based in Italy. Active since 2011. Galician Night Sky Brightness Monitoring Network, using 14 SQM-LR installed at several of its automated weather stations. Real-time and historic data are freely available at MeteoGalicia. More info here. Loss of the Night - Easily accessible web application. Unihedron supports the goals of the International Dark-Sky Association. This adaptor kit was designed specifically for the SQM-LU-DL meter which is longer than our other meters. 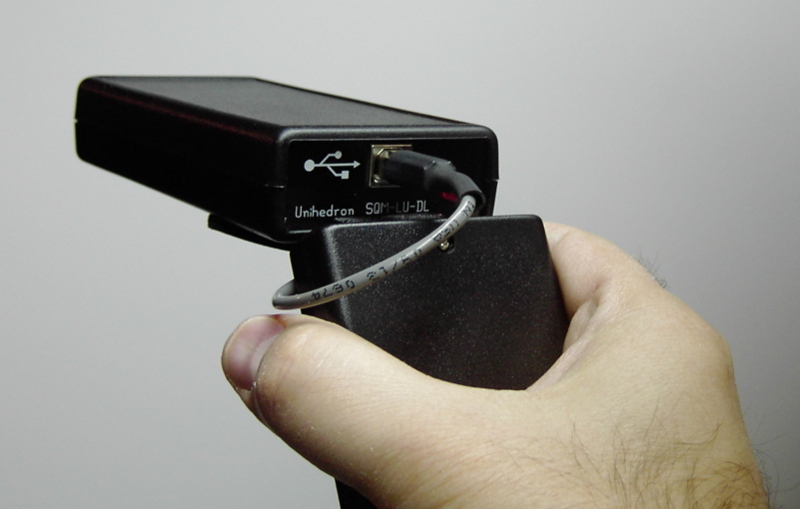 The adaptor screws into the back of the SQM-LU-DL and allows the meter to be mounted on a tripod with a 1/4-20 thread. The kit includes one tripod adaptor, 3D-printed plastic, and two longer screws (to replace two short screws already in the meter) 3D part view. Note: The built in compass on the SQM-LU-DL-V (Vector meter) is very sensitive to hard and soft iron. You may notice variations in the Azimuth (compass reading) while mounted to a metal tripod. Also, brass screws (that come with the SQM-LU-DL-V-battery holder) must be used to secure the adaptor to the SQM-LU-DL-V. This Window mounting bracket is used for moving light pollution studies while a "connected" meter and GPS are attached to a computer using UDM logging the continuously with GPS option enabled described at this forum post. You may also be interested in; the SQM-LE/LU housing, or our low-cost handheld sky meter (SQM), or our narrow-field handheld sky meter (SQM-L), or our Ethernet conected sky meter (SQM-LE).